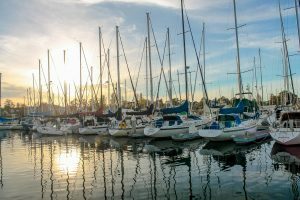 The beauty of sailing is you can find a boat that will be exactly what you are looking for because boats come in all sizes, shapes, and types. All sailing boats have the following components: a hull, a mast, a sail, and rope. A hull is a fin that’s located right under the bottom of the boat. It improves the stability of the boat and is also used for steering control. A mast holds the sails. A boat floats because it is less dense than the water in which it floats. Density is measured in mass per units of volume. The density of a boat doesn’t only have to do with the material that the boat is made of. To float, a boat needs to be less dense than the water that it will float in. If you place too much cargo or too many heavy items on a boat, its density will surpass the density of water and the boat will sink. Freshwater has the density of 62.2 pounds per cubic foot. Saltwater is denser than freshwater. Its density is 64 pounds per cubic foot. This means that objects will float better in saltwater than they will do in freshwater. When floating, a boat displaces a volume of water equal to the weight of the boat, which is why the weight of the boat is also known as displacement. Based on the shape of their hull, all sailboats can be divided into three major types. Sailboards are surfboards with an attached sail. There are many types of sailboards and you can choose one that’s right for you depending on your skill level and intended use of the board. Sailboarding is great in part because of how easy it is to store and transport sailboards. Oftentimes you can simply attach your sailboard to the roof of your car. Sailboarding also comes with a number of aerobic benefits. Windsurfing can be much harder than it looks and it will engage all the muscles in your body. Multihulls are boats that have several hulls. A catamaran is a boat that has two hulls. A trimaran is a boat with three hulls. 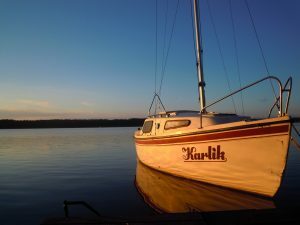 Small multihulls can be very exciting to sail because of the hulls can lift out of the water and you will feel as if you are flying across the water surface. Bigger multihull boats are great for cruising because their width leads to increased stability. Being very light compared to other types of boats and not having as much underwater surface, multihulls are usually very fast. 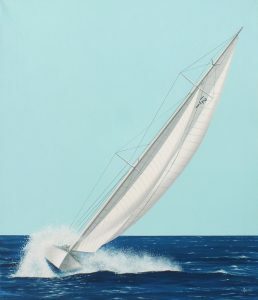 A monohull is the most common type of a boat in the world. Monohulls can be divided into dinghies and keelboats. If you go to a sailing school, you will most likely be learning how to sail using a monohull.